As the ball snapped on that New Year’s Day in 1943, it was Ed Doherty as quarterback for Boston College vs. Alabama. And the place was the Orange Bowl. Exactly one year later, Ed was again on the field at quarterback, this time for the East team in the Shrine East-West game. After graduation from Boston in 1944, where he made several All-American teams, Ed took a job as backfield coach at St. Cecilia High School in New Jersey. His boss was a young head coach named Vince Lombardi. Ed also held down the backfield coaching slot at Norte Dame; his alma mater, Boston College; and for the Philadelphia Eagles. He was head coach at Holy Cross, Xavier University, University of Rhode Island, Arizona State and the University of Arizona. Ed spent 12-years coaching football at St. Mary’s and Salpointe High Schools, during which he led teams to the state playoffs 9-times, brought home 4-divisional titles and took 2 state championships. Ed, Salpointe Director of Athletics Emeritus, was honored as Border Conference Coach of the Year (All Sports), New England College Football Coach of the Year, Tucson Al-Star Coach of the Year and many more. 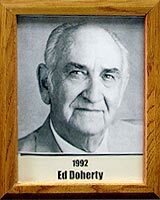 Ed was inducted into the State of Arizona Sports Hall of Fame in 1983 and is a member of the Arizona State Sports Hall of Distinction, as well as the Boston College.